I can remember when the nighttime sounds of forests on the Big Island in Hawaii were filled only with the unique songs of native insects. Having studied native Hawaiian crickets for nearly three decades I’ve become familiar with the deep, cow-bell pulses of the Hawaiian tree cricket and the soft, sleigh-bell pulses of Uhini iki, the Hawaiian swordtail cricket. Today, they can barely be heard. In the past few years, a population explosion of the invasive coqui frog (Eleutherodactylus coqui) has transformed the acoustic landscape of Big Island forests into a monotonous din, masking these native songs. Tens of thousands of amphibian voices, calling “ko-keee, ko-keee, ko-keee,” mask the songs of native endemics. So dense and widespread are the populations on the island that state officials have deemed the goal of permanent removal unfeasible there, focusing instead on eradication efforts for the remaining islands where the coqui has yet to deeply establish itself. Now the coqui has arrived in California. With few, and relatively small infestations, California should act immediately to eradicate this destructive invasive species. The coqui may look innocent, and even sound sweet to some, but its brief history in Hawaii tells a tragic story of how delayed action can have devastating consequences for biodiversity and human well-being. Although native to Puerto Rico, the coqui invaded vulnerable island habitats by hitching rides on commercial nursery plants. In Hawaii, home to thousands of endemic species, the coqui has had catastrophic impact following its introduction in the late 1980s. Unlike in their native range, coqui have achieved astonishing densities, often as high as 20,000 frogs per hectare (or 2 frogs per square meter), and sometimes over four times that number. 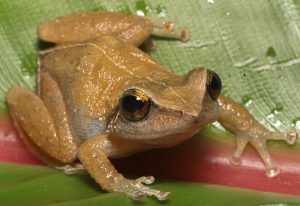 These high densities likely arise because the frogs have escaped their natural predators and diseases, factors that regulate coqui numbers in Puerto Rico. The coqui is a predator itself, and its high numbers are bad news for native Hawaiian arthropod species, which the frogs consume with voracious appetites. Each frog consumes about eight prey animals per day, and thus, in that one square meter, on any given night, a loss of between thirty and seventy invertebrates can be expected. To put this threat on a human scale, such a density would equate to approximately 20 Tyrannosaurus rex’s per square kilometer. Admittedly, a T. rex might eat just one human per day; nevertheless, we wouldn’t stand a chance. For the Big Island’s endemic arthropod species, this analogy suggests a grim future—and sadly, it is more than just a suggestion. In the last decade, frog populations have steadily expanded upslope from Hilo toward the Kilauea summit, such that now the night-time acoustic landscape is filled with a coqui cacophony, revealing massive populations of frogs. As recently as five years ago, native cricket numbers were healthy on Kilauea’s northeast slope. Further surveys are urgently needed, but in the vicinity of Glenwood, where there once were hundreds of thousands of crickets, they are now completely gone. And what of the other tiny forest creatures that do not reveal their losses so readily through the disappearance of sound? One must conclude that they too have been vacuumed up by the voracious coqui. There are also well-known human impacts. Coqui are loud, disturbing residents’ sleep, eliciting visitor complaints at hotels and resorts, and depressing real estate values in infested areas on the Big Island. In addition, Hawaiian nurseries have repeatedly exported frog-infested ornamental plants, only to suffer economic loss when their shipments are destroyed or returned. Many will be unmoved by the loss of the tiny, unseen creatures of the forest—the beetles, the spiders. But these creatures constitute the food source of Hawaiian honeycreeper birds and are pollinators of spectacular endemic plants such as the Hawaiian hibiscus, orchids, and silverswords. Likewise, native crickets perform ecosystem functions such as nutrient cycling, which plays a vital role in sustaining rain-forested watersheds. Unchecked predation by frogs has the potential to drastically destabilize the native ecosystem. Indeed, the only beneficiaries of the frog expansion likely will be those that eat frogs, such as invasive rats. Indeed, the only beneficiaries of the frog expansion likely will be those that eat frogs, such as invasive rats. Rats, in turn, will pose an even larger predatory threat to the imperiled native birds than they already do, and to humans, since they serve as a reservoir for rat lungworm. Ultimately, the negative human impacts of these frogs are multifaceted and far-reaching. There continue to be serious efforts to suppress and eradicate coqui on other Hawaiian islands, thanks to neighborhood coqui-watches, an invasive species program that backs “coqui-free” nursery business certification, and state law that makes it a felony to intentionally transport, import or harbor coqui. Hawaii’s coqui explosion has not only had huge local costs, but also downstream effects beyond the Big Island . For, despite similar coqui watches on other Hawaiian islands, the enormous reservoir of frogs ensures further accidental introductions on the other islands due to regular shipping traffic. Moreover, these invasive populations may act as stepping-stones to other west coast states such as Oregon and Washington, where coqui may encounter favorable habitats. Now the coqui has arrived in California, probably via contaminated plant shipments from Hawaii, with occurrences documented in nurseries in Torrance, Orange County, and San Diego, where their loud but unfamiliar calls have been mistaken for car alarms and exotic birds, and have become a general concern to local residents. Moreover, these invasive populations may act as stepping-stones to other west coast states such as Oregon and Washington, where coqui may encounter favorable habitats. 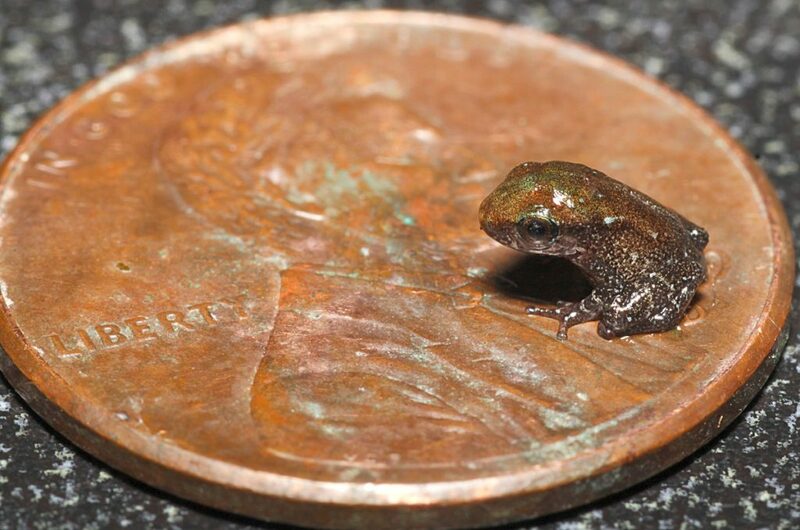 With Hawaii as a warning lesson for what happens when tepid measures are taken, California should swiftly and thoroughly eradicate the invasive coqui immediately. By playing a waiting game, California encourages a much more costly problem down the road that threatens biodiversity, the economy, and human health. Established populations have only been found at nurseries so far. But that is precisely where the coqui invasion got its start in Hawaii. This article is reproduced with permission from Scientific American. It was first published on June 8, 2017. Find the original story here. Kerry L. Shaw is an evolutionary biologist and ecologist at Cornell University.